Hello Friends and happy almost Friday! With Easter only a few weeks away I decided it was high time I dusted down my Easter supplies and get to work as I do like to make and send out Easter cards! 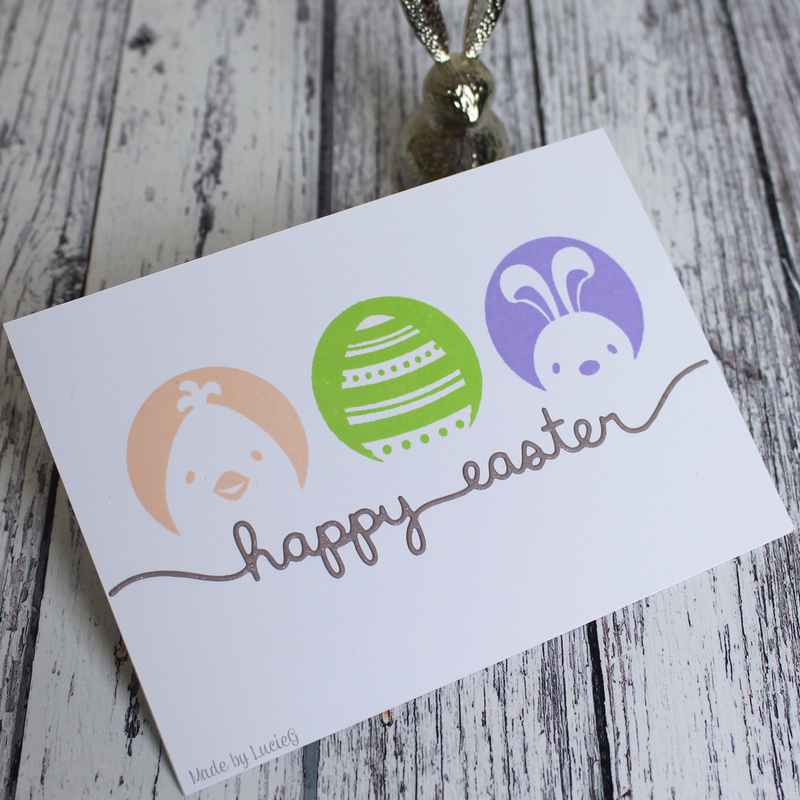 I unearthed a cute stamp set by Pink & Main which I think arrived too late for Easter last year so I decided to use them for a super quick CAS card. I wanted to play along with the colour challenge over at CAS Colours & Sketches and selected a few Altenew inks which seemed to match the challenge colours. Then my eyes landed on my newly-acquired Gina K inks and I decided it would be good to test them out on these stamps – so I ended up with two cards! First up here, the Altenew inks card. I LOVE the Altenew inks and find they stamp very well – in fact I have all of them in my collection! I added a Lawn Fawn sentiment which I had smothered in Nuvo Aqua shimmer – love the delicate sheen! Next my Gina K inks. I won some at Simon Says Create and have been trying to swatch them since I got home. They also stamp very nicely and the colours are so vibrant. Think I’ll be reaching for these a lot too! I used the same Lawn Fawn die cut but in the interests of comparison, I painted the die cut with a layer of Ink On 3’s Pixie Dust. Oh my goodness! Can you see that shimmer? Wonderful! Now I want to PIXIE DUST ALL THINGS!! Just adorable! Love how you used the colours for the images with a CAS design. Thanks for playing along with us at CAS Colours & Sketches this week. Looking forward to seeing your creative projects in the future galleries again. Love these graphic images and your use of the colors. Thanks for joining us at CC&S this week! What a lovely card, great use of this week’s colors. Thanks for playing along with us at CC&S. Cute Easter cards! Great use of colors for this week’s challenge. Thanks for playing along with us at CC&S!